I was listening to a podcast on my drive in to work today, and the host and the guest were two women talking about their businesses and the impact they have on their community. They were articulate and down-to-earth, and I liked what they had to say. 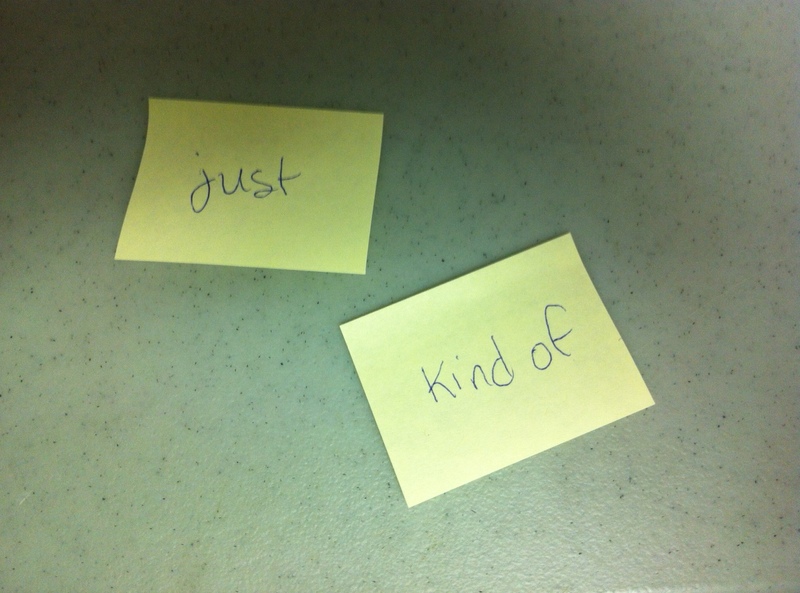 But every now and then when they were describing something about their work or their thoughts, they’d use the word “just” or “kind of,” and it got me thinking about how often I do the same thing, as a knee-jerk reaction. I’m kind of thinking I don’t like when you do that. It’s just that it bothers me. I’m kind of excited about this new business venture I’m planning. It’s just a small idea. These words minimize. They make a thing small, less noticeable, less of a big deal. When I use them it’s because I’m uncomfortable and I want to make it easier for me to speak up or articulate something. It’s like a shrug or avoiding eye contact. Have you ever noticed these words before, and what they do to your sentences? When I start to pay attention to them, they’re everywhere. I guess it’s kind of a random thought to share, but then again, this is just a blog. This entry was posted in Leah's thoughts and tagged communication. Bookmark the permalink. This is such a good point and I totally also notice in myself and others that we downplay our emotions by using modifiers to lessen what we’re saying. I would even wonder if it can be tied at all to gender…If it’s part of our conditioning to coat our opinions with words that lighten the strength of the statement. I think you’re absolutely right, Krista!